The 2013 Burn (our eighth) is now history, and it was another great one for Perky and Lashes – our playa alter egos. I was thrilled to meet several readers of this blog site who took pains to say hello at the Burn and let me know that they enjoy the articles and find them helpful and inspiring. Aside from new friends, this burn was exciting for at least three reasons. First, the art cars were more plentiful, more whimsical and more fantastic then ever. And while the best of the best may well have been tried and true entries such as the giant, fire-spewing octopus (El Pulpo Mecanico); new players such as the mobile board room, a steam locomotive, a fish lighted in varying colors and shapes and a covered wagon as well as the many electronica-blasting party cars, roamed the playa. Second, this year’s Temple of Whollyness was a true work of art and a space that spoke to you in hushed, yet urgent terms about your humanity and your responsibility to others and to the world. 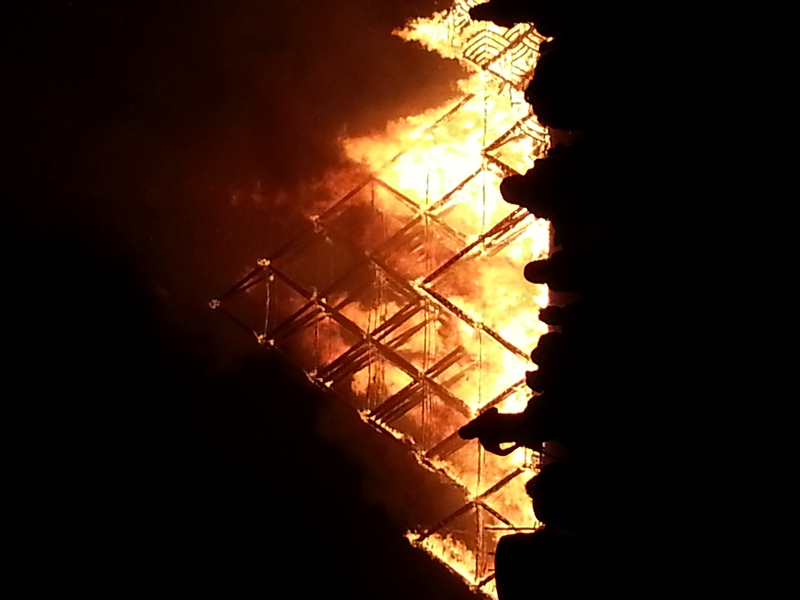 The Temple burns on the final night of Burning Man 2013. We enjoyed a very special moment on the first Sunday evening, when the Temple was dedicated and turned over to the citizens by its builders. To demonstrate the construction process for the Temple, its builders fitted together six pieces of especially designed wood without the use of any fasteners or glue. This block of wood was repeated throughout the Temple to create a solid structure that stood in perfect harmony with the natural environment around it. When the builders completed the wooden square, they handed it to Ranger Carousel, head of the Temple Guardians, the group which has responsibility for gently guarding the building throughout the Burn. Carousel then accepted the Temple for the citizens of Black Rock City and declared it open to all. The thrill for us is that Ranger Carousel is our son. We are the proudest of parents. Art is the major focal point for many Burners, ourselves included. We already know that we’ll have to look at various websites to see all of the art – it’s impossible to see everything while you’re on playa – but we did enjoy some amazing works such as “Truth is Beauty,” the sculpture of a woman that soared hundreds of feet above the playa. There’s no such thing as a perfect burn, and this one had its problems – chief of them the amount of bike traffic. With the population exceeding 60,000 people for the first time, there were issues with congestion on the main roads. I also didn’t realize until later that the earlier-than-normal Temple burn had caught many burners by surprise, hence a low turnout for that event. Finally, this year’s Exodus was complicated by concerns about a possible rainstorm Monday afternoon. It took some people 10 or more hours to leave the playa. These issues not withstanding, 2013 was a highly successful burn for the two of us. Now it’s back to the default world and transforming ourselves from Perky and Lashes back into Alan and Judie. It will take a few days to adjust to the fact that showers are a normal part of life and you have to pay for a drink when you go to a bar. But it won’t take any time at all to start dreaming about and planning for Burning Man 2014.